I don’t know about you, but I don’t have a very green thumb. When I started to garden, someone suggested planting zucchini because “everyone can grow zucchini.” Wow were they right! Zucchini was popping up in no time and I was up to my curly hair in green veggies! So I needed to find some way to use it all… I ate grilled zucchini for a week straight and then needed something a little sweeter, so I decided to bake it into a cake! 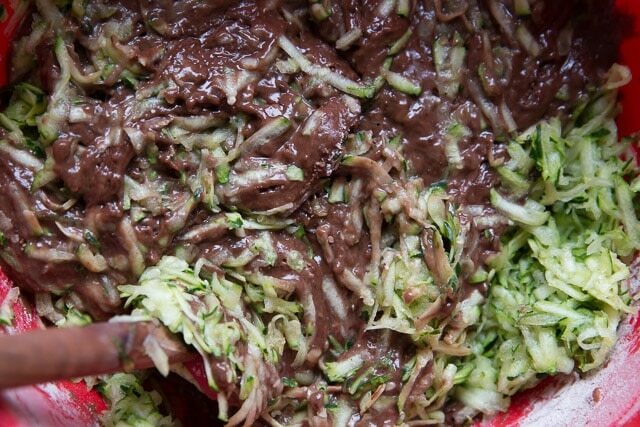 If you haven’t made chocolate-zucchini anything yet, you need to! The zucchini bakes right into the cake and your kids will have no clue they’re eating vegetables! It’s a win-win dessert! I fed this to my little cousins down the street and it was gone in less than 10 minutes. Before I even set the cake down on the table one of the kids has already stuck his hand up and stolen a slice! 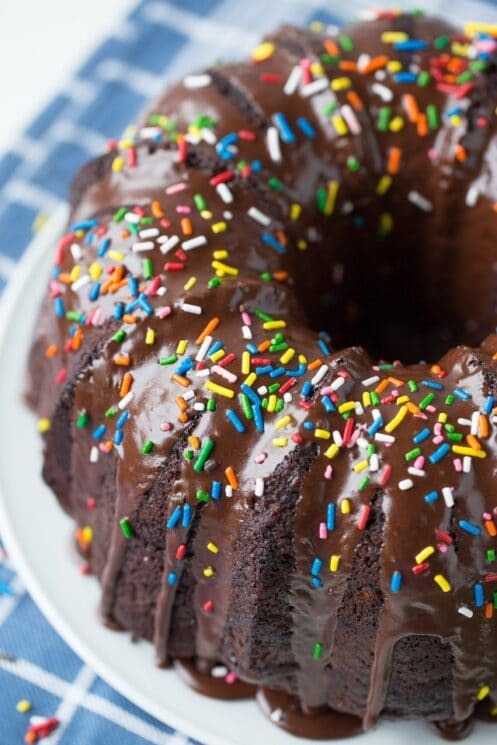 Between the drool-worthy chocolate and the colorful sprinkles, this cake is a winner for the kids (and adults). 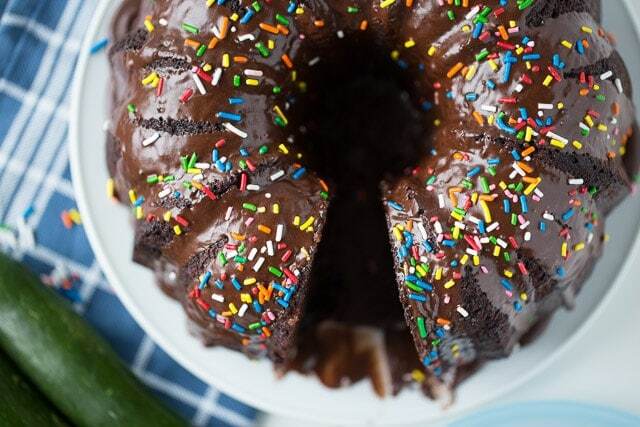 If you’re looking for a gluten free chocolate zucchini recipe, we have that! There are mini chocolate chips and chocolate glaze in the recipe–both are optional. If you leave off the glaze, you can slice up the cake and pack it in lunch boxes without much of a mess! But if you’re celebrating a birthday then top it with glaze and add some sprinkles! I used banana to substitute most of the oil in this recipe, which also helps to keep it from drying out over time. 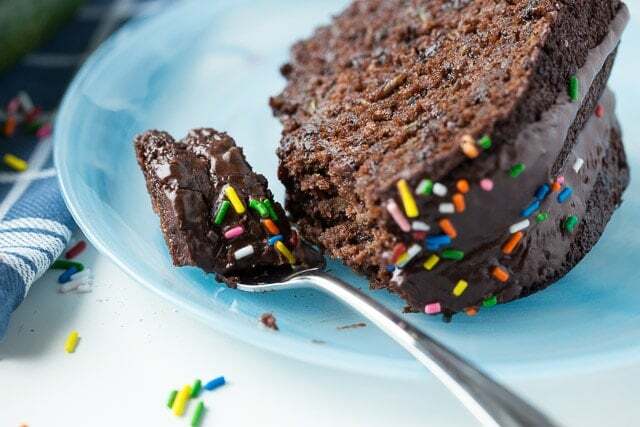 So if you don’t eat the entire cake in one sitting (even though your kids will want to) then just place it in an airtight container and keep it in the fridge! And if you want to make this cake into muffins… you totally can! I always make 1 muffin when I make a bundt cake because I just know I won’t be able to wait until the cake cools to try it! When you’re at the store picking out your zucchini, pick the small ones! The large ones are mostly water so you get fewer nutrients per bite! Preheat oven to 350 degrees and prep a bundt pan by greasing it and dusting it with cocoa powder. 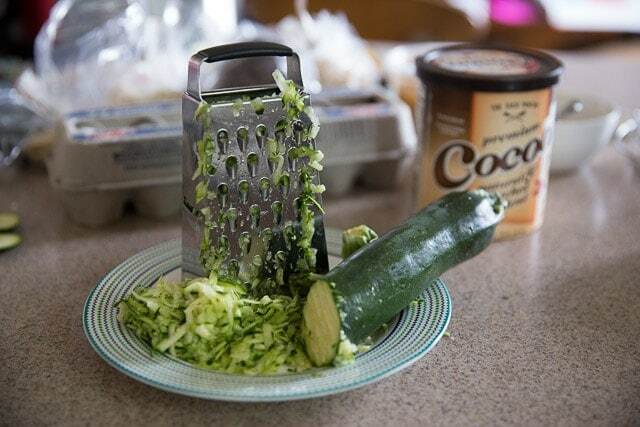 Use a cheese grater or food processor to shred the zucchini. I needed 3 small ones to get 4 cups! In a large bowl, combine flours, cocoa powder, salt and baking soda. Set aside. In another large bowl, mash your small banana. Add coconut oil, sugar, honey, brown sugar, eggs, vanilla and greek yogurt. Add dry ingredients to wet (if you’re using the optional mini chocolate chips leave 1 tablespoon of the dry ingredients in the bowl and coat the chocolate chips in it). Stir until almost combined and then add the shredded zucchini and the mini chocolate chips coated in the extra dry ingredients. Don’t over mix. Pour into prepared bundt pan and bake for 50-75 minutes or until an inserted knife or toothpick comes out clean! 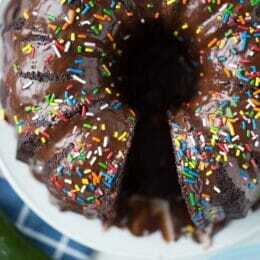 Chocolate Glaze: Combine powdered sugar, cocoa powder and 2 tablespoons of milk in a bowl with a whisk. Continue to add more milk until you reach the right consistency! 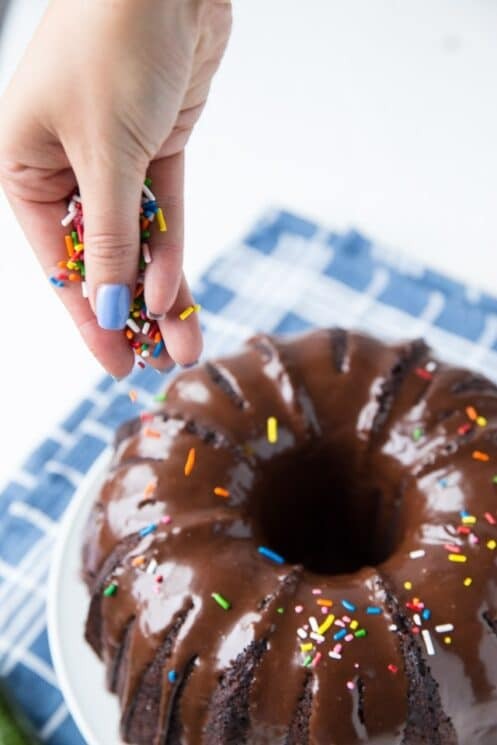 Pour (or pipe) onto cooled cake and top with sprinkles! How long are you baking for your extra muffin? I baked my lonely muffin for about 20 minutes! Which was longer than I would have expected, but my bundt cake was in there with it which probably made it take a little longer. I would start checking it at 15 minutes and go from there! Hope that helps Hannah! Also, can I make in normal cake tin? Not a bundt tin? If so, how long do I bake? Yes you can, bake it in a large casserole dish for about 25-30 minutes! Lizzie if I’m just making 2 mini bundt cakes how much of the ingredients do I use and how long do I bake them for?